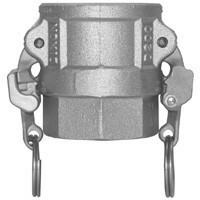 # DIXRD600EZ - Safety Female Coupler - Type D - Stainless Steel - 6 in. Produced to Commercial Item Description A-A-59326B. Ergonomic. Rotating action helps keep the locking device free of debris. Designed to protect critical parts from impact and to withstand rugged use. Easier to use in restricted spaces.